Choosing the right cookware can have a huge impact on your health. I have been writing about cookware in several articles here, but I am getting more and more convinced that ceramic cookware is what we are going to replace most of our cookware with. Although I believe that the pros outweigh the cons, it is time to find out all of them and I did a lot of reading to help me and maybe you make the right decision. In a hurry? You can find my choice of ceramic cookware here! I will try to discuss all the pros and cons and how to pick the right ceramic cookware. Nonstick coating. Most ceramic cookware is not made totally of ceramic. Most of the time they have a coating to make them non-stick. Non Toxic.This coating is nonstick that also means that the better brands make sure there is no toxins in their coating. Easy cleaning. The non-stick coating allows it to be very easy to clean and in most cases a mild soap is all there is required. Scratch free. The more durable brands like Xtrema is so scratch resistant that it can even be handled with metal utensils. Inefficient heat. Although the surface most of the time looks very smooth if you look under a microscope you will see that this is not the case. The coating is not smooth because of the particle in the material that is used. This makes it a little rough and not touch the meat everywhere. Durability. Compared to other types of cookware the ceramic is not as durable. The lifespan is shorter because it chips faster and is more sensitive to bumping and falling. Utensils. You cannot use any type of utensil in a ceramic pot or pan. Metal cannot be used at all because of the scratching. This will limit the type of utensils to wood, plastic or softer materials. Slow heat up. Ceramic cookware takes longer to reach the right temperature and this can be annoying. The coating is nonstick but that does not mean that it is not toxic. Reason to have a good look at the brand you are thinking about buying to see what their coating is made of. The wrong coating can leach Most in your food. The heat retaining and distribution is another thing I read about and have to form me an opinion about. Some brands cannot be used for high heat and only for lower temperatures. If you are looking for a skillet that you use for frying there is a brand available that I tell you about later. Although ceramic cookware is all natural and safe to use if you buy the better brands you will find yourself needing to get used to it. This small learning curve is in my opinion not a big problem if you know that cooking on ceramic is healthier. After reading and more reading and looking at forums and some of the consumer websites I have decided to go for the Xtrema brand. Like always I do not like to take any over hasted decisions and you can read my Xtrema cookware reviews here. If you have any experience with ceramic cookware you like to share feel free to leave it in the comments below. My choice does not mean that it is the best ceramic brand for your situation. 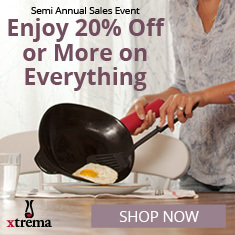 I like to cook on high temperatures and found that Xtrema is very well suited for that. My first purchase was an Extrema ceramic skillet since I use that the most.